Midway has provided us the first crack at an exclusive screenshot from Mortal Kombat vs. DC Universe. 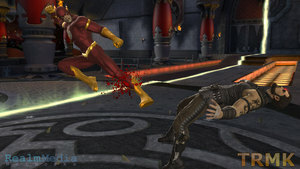 Featured in this screenshot is The Flash in a battle with Kano. I was on the midway boards, and I was told that there will be a model viewer available in the game for all us artist who continue to search for good screenshots for reference! that's why you see one character on screen with MK logo and DC logo beside them in some of those pics! SWEET! Fantastic screens. Still lovin' the Joker. And I never get tired of seeing Subbie with his classic slide move back in action. For too long it's been robbed from him.